If you’re ever in Neal Smith National Wildlife Refuge, keep an eye out for the ugliest bison alive. That’s not an insult. Taking a direct hit from a lightning bolt and staying alive is something to be proud of. 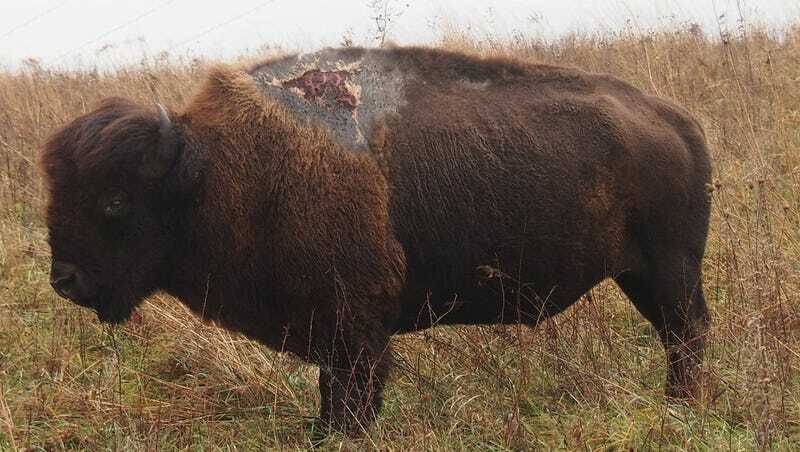 Sparky first caught the eye of Fish and Wildlife officials in 2013, when Karen Viste-Sparkman saw him standing with a huge bloodied burn wound on his shoulder. Sometimes FWS will intervene if it looks like an animal has been hurt or put in distress by human meddling. However there is no intervention protocol for—depending on your point of view—natural injuries, or bad luck, or angering a vengeful god. Viste-Sparkman figured the animal would die. That was 2013, and about a week ago, Viste-Sparkman spotted him in a much better condition, physically if not aesthetically. She snapped a picture. Thin and battered-looking, with the healed wound still very visible on his shoulder, the bull was still alive and seemed healthy. FWS officials have taken to calling him “Sparky” and are monitoring him. Sparky was nine when he was hit, and had fathered three calves. Bison live twenty to twenty-five years, so everyone’s interested to see if he’ll keep chugging along, spreading his lightning-resistant genes to the rest of the herd.